Well my closed season plans have been scuppered, a very cold spring and now it finally has warmed up I'm stuck at work - and it looks like work is encroaching on my weekends. My pond & canal fishing and even my scouting missions have been pretty nonexistent. 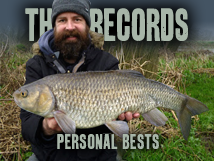 I have managed three trips; the first was a cold afternoon blank down the Farm a few weeks ago - it was never going to go off but I had to wet a line. The next was a couple of hours fly-fishing for trout. Jeeze I'm out of practice, but in-between clumsy casts I managed to hook two - both of which came off at the net. All the fun of the fight, none of the proof of the photo! And on Saturday the sun finally made an appearance, so I headed back to the Farm. I think every angler within 100 miles had the same idea - never seen it so busy. 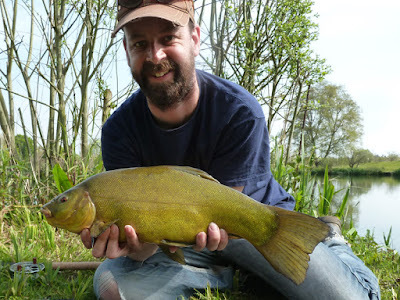 Unfortunately the fish had spawned the day before and were still in a tight shoal, for the people sat on the 4 or 5 pegs where they were shoaled it was time to fill their boots, albeit with spawned out fish - I only managed to land one tench - I think she must have been lost!